The sixth post in my "Writing a Novel Series", which details my experience writing 151, describes my newly-patented system for writing a novel: scene-by-scene storyboarding! Now that the details of the world and the characters who would be living in it were fleshed out, is it time to write yet? No, not quite. Before doing anything, I wanted to have a clear understanding—a plan—of what would happen during the novel, even on a scene-by-scene basis. Sure, I knew basically what would happen at different parts of the story, but I didn't know how it would happen and how the pieces would fit together. This would definitely help! First thing's first: there's only so much planning one can do when it comes to the details of the world and its characters. I didn't want to pull a JK Rowling and have an entirely vivid view of the world and those within it, before I even know how the story would actually play out. One could, of course, never stop adding details and characters to a vision, many of which would never make it into the story proper. 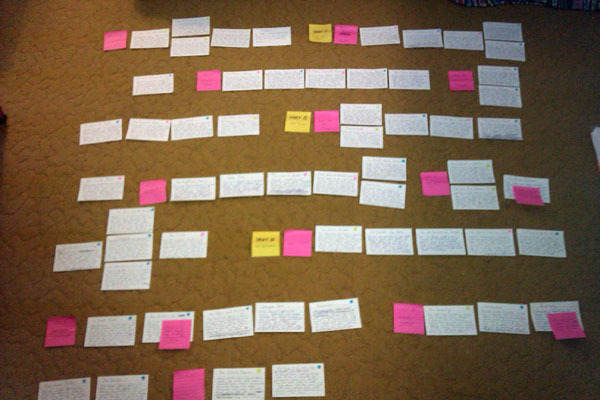 I wanted to avoid that situation—first I would roughly map out the scenes that would make up the novel. Only after that would I know what details I'd need. In order to roughly map out each scene, I used a card system, which was my equivalent of drawing storyboards for a movie. 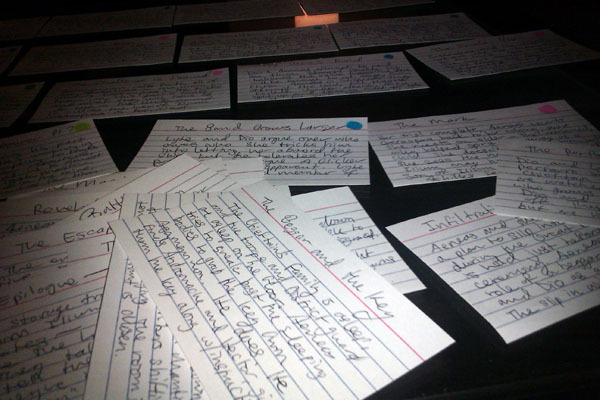 Each cue card would represent a key scene or plot development in the story. Sometimes it would be a sprawling action sequence, sometimes it would be an intimate moment between two characters, sometimes it would be a key turn of events. At the top of each card, I wrote the title of what that scene would be. One example is "Hero is tortured", the title of an early scene in which the hero suffers greatly at the hands of a villain. On the rest of the card, I wrote a brief summary of what would roughly happen in that scene. But it wasn't over yet. I first needed to make sure that the scenes I had laid out balanced the focus of the story equally among each of its main characters. 151 weaves together several main story threads, each of which is related to the other. In order to keep track of which thread was where, I placed a coloured dot at the top right of each of the scene cards on the floor, with the colour representing which thread that scene developed. My goal with this was to visually understand whether I was spending too many scenes in a row with one thread, and to help me mix them up a bit and to maintain the feeling of balance.